Our old Melways street directory has gathered dust for years. We use Google Maps on the phone now. A man who sounds like George Bush barks out, ‘In 20 meters, at the roundabout, take the third exit. Take the third exit’. Despite his name, George is absolutely useless in the bush. Google Maps doesn’t show most dirt tracks and phone reception is often poor away from towns and highways. Last weekend, we used a fantastic new GPS app during a day walk in a nearby national park. It’s a free app for Android phones and iPhones called Avenza PDF Maps. (If you’re the one reader of this blog who owns a Windows phone, you’re out of luck, yet again). The app is really simple to use. Instead of continually downloading a road map or satellite image, as Google Maps and Google Earth do, you instead load a PDF map (a geo-referenced ‘spatial PDF file’) onto your phone or tablet before you leave home. The map is stored on the phone and the phone’s GPS sensor shows your location, even when phone reception is poor. We used the app last weekend on a drive and walk in the wonderful Chiltern-Mt Pilot National Park. The night before I bought and downloaded a topographic PDF map of the area from the Victorian Vicmap web site, and imported the map to the PDF Maps app on my iPhone (which is a breeze). Screenshot of PDF Maps on an iPad. My routes and place marks are overlaid on an imported topographic map. The layout is similar, but smaller, on an iPhone. Click picture for a sharper view if image is blurry. That’s all you need for the app to work, but I also used Google Earth on my computer to plan our route. We intended to walk up an old track to a low summit, then go cross-country from rock outcrop to rock outcrop, and back on the other side of the ridge to the car. I drew the path on Google Earth and imported the path file into the PDF Maps app, which overlaid the route on the PDF base map, as you can see above. The next day we drove to our starting spot and opened the app, which showed our location and planned route on the screen. The ‘Record GPS Tracks’ option marked our path as we walked around. Along the way I ‘pinned’ some place marks (way points) to places we might return to some day – a stand of veteran trees, an old grass-tree, a great view. Every so often, I took a photo with the iPhone camera, and the app linked the photo to a point on the route. When we got home, I exported the route, way points and photos to the home computer (although this step isn’t necessary). A phone app is no replacement for a proper GPS, especially on a long remote walk or if you need super-accurate locality readings. That said, I’ve never used a GPS that looks this good and is this simple to use. It’s perfectly suited for recording points of interest on a day walk. It’s extremely quick and snappy, with no slow delays. The menus are big, clear and simple, and the maps and way points are easy to read in the sun. 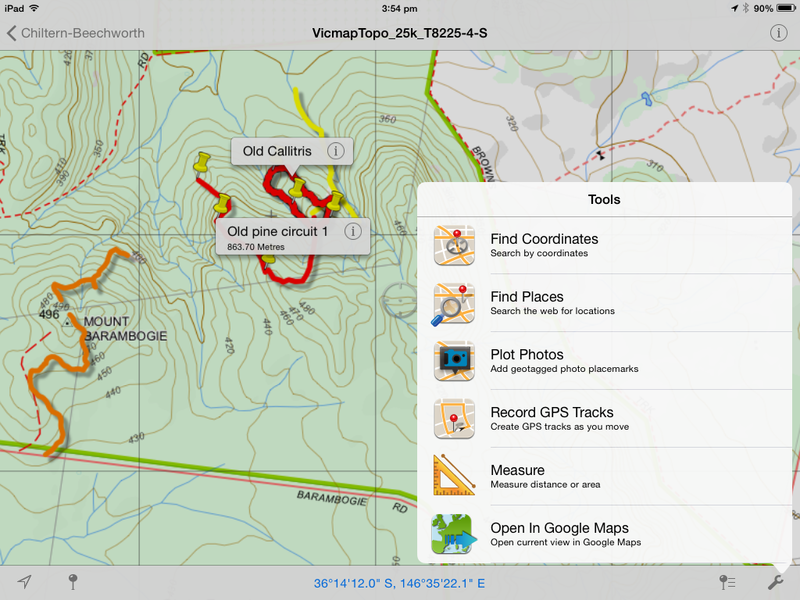 The Victorian Vicmap web site recommends the PDF Maps app for viewing their topo maps on mobile devices. Parks Victoria also has free PDF Maps of some National Parks on their web site but not many at this stage. If you want an easy-to-use GPS app for your mobile phone, give it a try. You may have to pay for the base maps (depending where you get them), but the app is free. I’ll be using it to record our walks and the things we see from now on. It sure beats listening to George. Do you use this or a similar app when you go out in the bush? What do you most like about the system that you use? 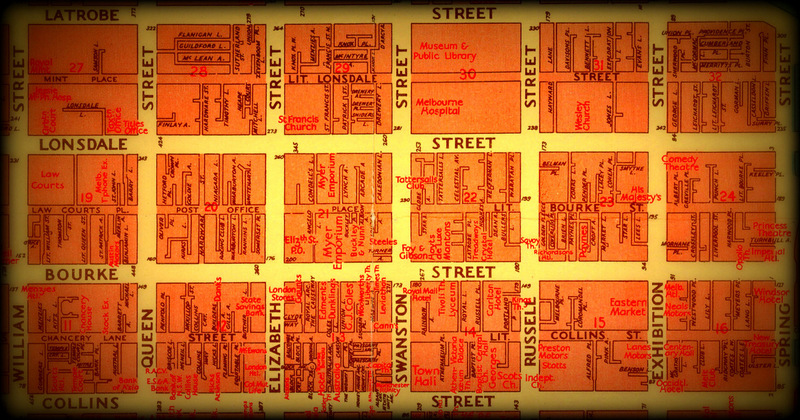 The top photo of an old street directory is from the State Library of Victoria blog site. Next Burning (for) biodiversity: what is a patch burn mosaic? Oziexplorer for Android is good if you want to use .ecw format maps. Look forward to seeing Rowan’s app. I’ve been using a free GIS app on Apple and the Qld veg data in vector format for survey work in Qld. It’s very useful data to have at your finger tips in the field, but an optimised app would be a big improvement. You can produce your own georeferenced PDF files for use in Avenza. When you export your project to PDF, you’ll find a tick box in one of the options tabs of the export dialog form ‘georeference map’ or similar. Simply tick this option and then push the finished product to your iDevice of choice. Great for specialised or custom mapping requirements. Pocket Earth – http://pocketearth.com – Use it and LOVE it. Best offline map in the world IMHO. Maps for the whole world, any zoom level, wiki travel articles and Wikipedia place articles. No data connection required. For the price of a coffee. Mapping app to end all mapping apps! UPDATE: I downloaded the Pocket Earth app to compare it against PDF Maps. It looks like a great app but has different strengths than PDF Maps. PDF Maps provides a great, simple way to view topographic maps (spatial, geo-referenced PDF files) which can be downloaded from state mapping sites. As shown in the picture above, these maps are great for bushwalking in areas with few or no tracks. By contrast, Pocket Earth has a great library of free offline road maps but doesn’t seem to have any detailed maps of topography or tracks in bushland reserves from SE Australia. (If you have access to a GIS program and have the know-how, you can make and import these maps though). Both apps are designed to work well where phone reception is poor, or where you’d rather use a downloaded map rather than pay data-roaming charges, if for example you are travelling overseas. Mate, it worked a treat. I used it to mark heaps of potential sites, and did need it to help me find my way back to the actual road when I was skiing on a skidoo track instead. Just figuring out now how to upload the points I marked to google earth… shouldn’t be too hard, eh? I’ll try the app on my Android phone tomorrow. I have been using my garmin to help navigate around the 12,000ac we cover in the Rushworth Forest. Old grass trees. How about one 4m tall, that is old. Another note from our patch of the forest. It is a mixed Ironbark/Greybox mixture and I have been photographing and now GPS locating all the trees struck by lightening. Interesting point not one of these trees has been a greybox all have been ironbark. While the odds would favour the ironbark on numbers to not find a greybox struck is interesting. On the mosaic patch burning no view. But we have noted with concern that where the leaf litter is thick (across largish areas of the forest) very little undergrowth and what there is struggles to live, yet where the trees are spaced out at what we assume to be a more natural spacing the forest ecosystem is filled with mid storey and low storey vegetation including the wild flowers and orchids, the switch to drier conditions is going to see many of the orchids fail to survive as they have begun to yellow off and die. But what is pleasing to observe is that they are spread throughout the area we regularly walk either singly or in clusters of 3-5 and patches of 50-100. Few old trees as the forest has been cut over twice once during the gold mining era and then again for firewood and timber. Of the oldest stumps with chainsaw marks the termites have almost eaten them only a shell remains. Interestingly some tree stumps have had two regrowths the original stump 80cm then 40cm and now a live stem of 50cm indicating the stump is quite old. The concern we have is that there are too many trees, insufficient moisture to support them and in these areas a dearth of understorey plants. Lightening strikes are a concern given the fuel load in the forest and controlled burns often get out of control and the heat becomes intense and can be seen in the destruction and regrowth on the surviving trees and the forest floor. Hello Douglas, thanks for your great observations. Wow, that’s a whopper of a tall grass tree! Your screen shots show coordinates in dms.s. I downloaded vicmap topo maps for Anglesea (1:25000, A0 size) and get coordinates in decimal degrees (ie, d.dddddd). I don’t know whether the coordinates system is specific to the map, or georeferenced from the web site. I’ve looked in the PDFs maps app and online to find out how to convert the units to my preferred system. I know the conversion is straightforward, but i’d like the app to do it for me. Any insights? Hi Patrick, hmm, I had to search through the settings for the solution to your question, and couldn’t find one, but then I stumbled on it by accident. It’s really easy – just press where the lat/long (or AMG) is displayed at the bottom of the screen and it comes up with a list of options that you can choose from. Too clever by half 🙂 Best wishes, Ian. As a 67 year old Mac user since 1984, I feel totally inadequate in the face of the new smart-phone/tablet technology. It’s ok grandpa, don’t worry your pretty, grey old head, we’ll tell you what to worry about. At least that’s how I feel. Condescended to and sniggered at. PDFs maps is free after all, so what can one expect in the way of technical support? There’s me rant out of the way, back to using it to mark wildlife sightings on my walks so I can put them on the Victorian biodiversity atlas. Thanks for your solution! We are doing a 9-day walk in the French-Spanish Pyrenees and a week of day walks in the Dolomites. I think PDF maps might not be up to the task, how could I afford he matrix of maps to cover my area of interest? I work for Avenza Systems Inc. and I noticed your comments about having some difficulty with our PDF Maps app. You can change the coordinates for the map by tapping on the coordinates on your device. It will bring up a list of other coordinate formats to choose from. In regards to your comment below, even though PDF Maps is free, we at Avenza take great pride in our customer service and technical support. You can reach us via telephone (1-416-487-6442) Monday to Friday, 9:00 am – 5:00pm Eastern or by email support@avenza.com. If you have any questions at all, please do not hesitate to contact us.